Beautifully renovated 4 BD, 3 BA classic colonial Cape Cod-style home in the Wayne area of Radnor Twp. Center Entrance Hall opens to an expansive, bright Living Room with crown molding and enhanced millwork around the fireplace. Nearby, an Office/Study with walls of windows offers sweeping views of the level, fully-fenced rear yard. The formal Dining Room has enhanced millwork. Beautifully renovated Kitchen with custom cabinetry, Bucks County Soapstone counters with built-in drainboard & integral farmhouse sink, glazed subway tile backsplash, glass front cabinets and display shelving, and pendant lights. The distinctive beadboard ceiling is accented by recessed halogen lighting. Appliances include SubZero refrigerator, Miele dishwasher, wall oven, warming drawer, & gas cooktop, Thermador downdraft exhaust system. A soapstone-topped custom island/dining table is the focal point of the Breakfast Room which is open to the sunny Family Room. Glass doors from both rooms lead to the rear patio which is graced by a custom pergola. The courtyard features perennial plantings and opens to a 2nd rear patio, which is nestled behind the THREE-car garage. The 1st Floor Master BD Suite has soaring ceilings, two custom walk-in closets, linen closet, and large windows. Master BA has French limestone walls, dual vanity with Venetian Gold granite counters, radiant heat tile floor, and spa-like shower with rainhead and separate wall jets. The first floor is completed by a 2nd BD, two hall closets, and 2nd Full BA with subway tile and glass-enclosed shower. Upstairs are 2 more BD and a Hall BA. BD 3 has a closet and a charming nook which offers great play space. BD 4 has an unusually large walk-in closet and a window seat. 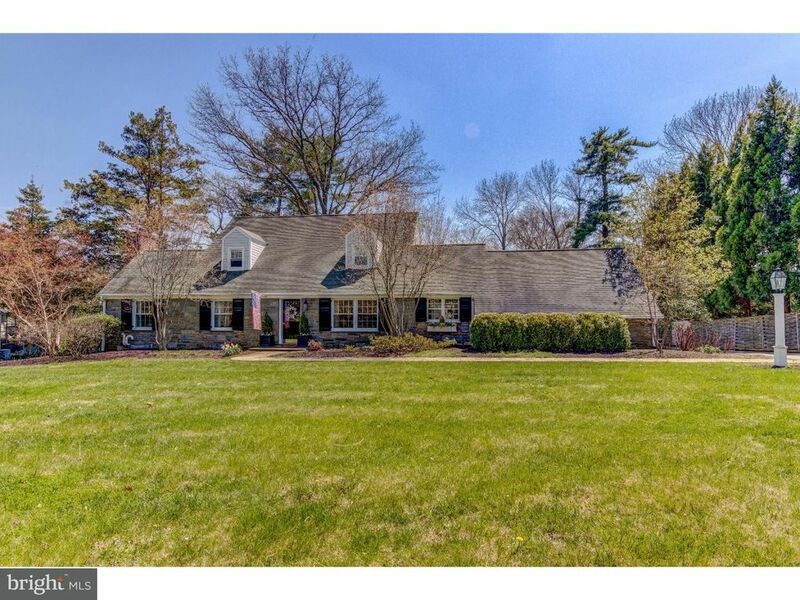 Scenic 3/4 acre property in the heart of the Main Line, just minutes from shops & restaurants in Wayne, Chanticleer, Radnor Trail, parks, schools, and train, with EZ access to corporate centers, the Blue Route, Airport, and Center City.